Here is the basic idea of Arlington Road, written by Ehren Kruger and directed by Mark Pellington. 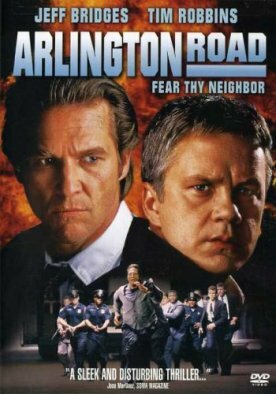 A history professor called Michael Faraday (Jeff Bridges), who teaches a course on terrorism, gradually realizes that his new neighbors in the pleasant suburb where he lives are terrorists. If that premiss strains your credulity just a little, it certainly doesn't that of Messrs Kruger and Pellington. In addition they make Faraday a widower with a young son—his late wife, an FBI agent, having been killed (you'd never guess it) by terrorists! So I guess he doesn't care much for terrorists, then. That he is thus set up for paranoia about the seemingly normal middle-class couple called Oliver and Cheryl Lang (Tim Robbins and Joan Cusack) who live down the street also doesn't bother the authors, even though they abide by the iron law of contemporary movie-making, which is that all paranoid fantasies must turn out to be true. There is even a certain chutzpah in giving the hero the name of the famed discoverer of electro-magnetism. Here, the film suggests, is another intellectual pioneer, an academic doing ground-breaking work in exposing the vast right-wing conspiracy that every Hollywood liberal is sure lurks just beneath the surface of America's suburban respectability. When the Langs' son, who seems to belong to the junior or De Molay branch of the v.r-w.c., befriends Faraday's son and they start inviting him round for barbecues, he begins to probe beneath this surface. His suspicions aroused by such suspiciously right-wing remarks as “It's a sorry state of affairs when you can't find a role model to vote for,” Faraday discovers that the supposed Oliver Lang is really William Fenimore, who was convicted of the attempted pipe bombing of a government office at 16. He also discovers that the Langs are now plotting another act of terror, but (what do you think?) he can't get anyone to believe him. The fools think he is paranoid! Even his late wife's sympathetic FBI colleague (Robert Gossett) is skeptical. Even his new girlfriend, a former graduate student (Hope Davis), thinks he's nuts—and so puts herself in extreme danger. And when the Lang/Fenimores realize that he is on to them they kidnap his young son as insurance that he won't expose them. Having lost his wife to the right-wing terror organization, will he now also lose his son and lover? Will he manage to persuade the police and the FBI of the reality of the terrorist threat in time to stop it? I'd better not reveal the ending, but here's a hint. In any Hollywood movie, never bet against the eventual confirmation of the most bizarre paranoid fantasy imaginable. building felt safe, secure,” Faraday tells his students—“just as you feel now. The next minute they were gone forever.” And they were blown up by a young man whose parents “considered him a moderate conservative.” Why take chances? Better consider all conservatives potential terrorists.